We all, as a chaplaincy have a role to play in safeguarding our church community. It is important, therefore that we know what constitutes abusive behaviour, what our duty is if we suspect that abuse is taking place and who to speak to or contact about this. We need to provide a safe and secure environment for all who meet together here. Safeguarding covers various groups of people; children, young adults, and the vulnerable adults. It is worth remembering that at different times of our lives we can all be vulnerable to some extent. Hence it is our duty to care about one another. The main groups of abuse are physical, sexual, emotional and neglect. However, there are less widely recognised groups, financial, organisational, spiritual, modern slavery, domestic violence and abuse, and self-neglect, so it covers a wide range of circumstances. If you are involved regularly in Chaplaincy organised activities with children, young people or vulnerable adults you may need to be subjected to a Safeguarding check. If at any time you become aware of any abuse taking place, no matter how slight your concern, then you must bring it to the attention of the Chaplaincy safeguarding officer or the priest in charge or you can report it directly to the diocesan office on a confidential reporting line. You do not have to have proof before you report a safeguarding concern. It is not your duty to investigate the situation. There is a notice on the church door with the telephone numbers of Roger and myself and e-mail addresses. 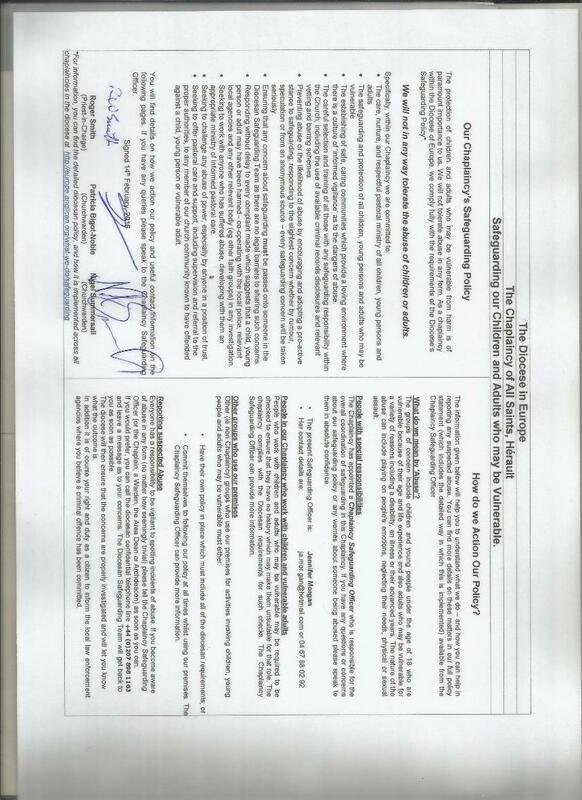 A copy of this notice appears below on this page. The new confidential telephone number to the Diocesan office is also displayed, alongside “ childline” and emergency numbers here in France. Also below is a link to the Diocesan website. On the door of the church, you will find a poster with the Safeguarding policy statement that our chaplaincy has adopted, stating our commitment to the way we treat people within our chaplaincy. Safeguarding our fellow christians is very important and we each need to take our responsibilities seriously and remember to do our duty should a problem arise. 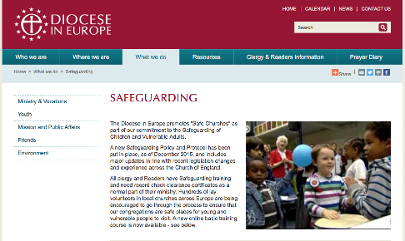 The Diocese in Europe operates a confidential helpline/contact procedure relating to the safeguarding of children and vulnerable adults interacting with the Church. To find out more, click the image to the right.